Limestone crushing process plays an important role in the whole processing plant. SBM Machinery supply high performance crushing machine for the clients' needs. 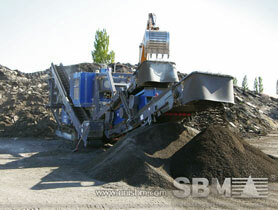 SBM manufactures a full line of limestone crushing process for road and in-pit use. SBM limestone crushing plants include limestone jaw crusher, limestone impact crusher, limestone cone crusher and mobiles series limestone crusher. Limestone crushing process is necessary in limestone processing, meanwhile limestone crushing machine is the key products of limestone crushing line. So the quality of limestone crusher is quite important. You can trust SBM supply the excellent proven limestone crushers. SBM limestone crushing plants have been sold to more than 100 countries and counties in the world. SBM is your single source for technologically advanced limestone crushing plant equipment. As a limestone crusher manufacturer in China, SBM can offer types of limestone crusher for sale, such as jaw crusher for primary crushing, impact and cone crusher for fine crushing, mobile crusher used as complete limestone crushing unit. "Jaw crusher, impact crusher, cone crusher is the most popular limestone reducing equipment manufactured by SBM Machinery."